Food science fact #1: Water molecules are stronger than sugar molecules and have the power to break them down. This means that sugar will dissolve in any temperature water eventually. But in the kitchen where time is often of the essence, use warm or hot water to dissolve sugar quickly. Heat water in a kettle or heat up a cup of water in the microwave. You don't have to bring the water to a boil to dissolve sugar. Add a spoonful of sugar to a heat-resistant cup or bowl. For a higher sugar concentration, pour just enough hot water over the sugar to make a runny, pudding-like consistency. For a lower sugar concentration, fill the cup or bowl halfway with hot water. Stir the sugar with a spoon until it dissolves, which is fairly quickly. 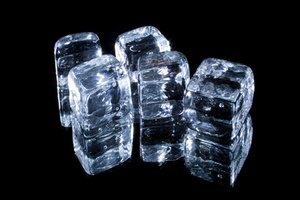 Food science fact #2: Hot water molecules move faster than cold water molecules, which helps them dissolve sugar faster. 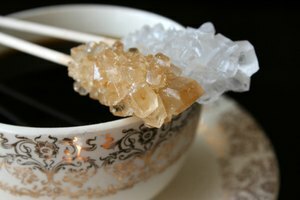 To dissolve a larger amount of sugar for a recipe or to make a simple syrup, add 1 part sugar, 2 parts water to a saucepan over medium heat. Control the heat as you stir the solution continuously with a wooden spoon, lowering the temperature when the solution starts to boil. 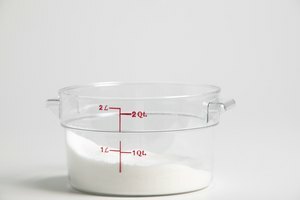 Decrease the amount of water or add more sugar, depending on how thick you want your dissolved sugar solution to be.